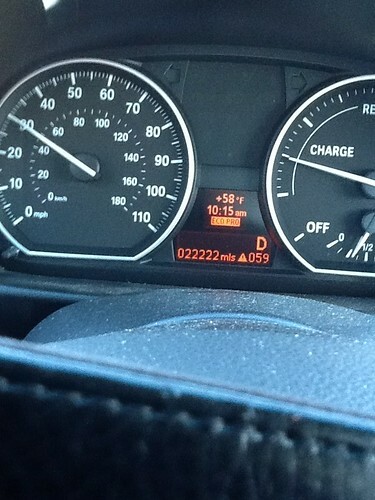 ActiveE at 22,222 miles, a photo by dennis_p on Flickr. Some things that I have learned these past 22,222 miles… 100 mile range is fine, but as more and more folks start getting plug-in cars, whether hybrid vehicles like the Fisker Karma or the Chevy Volt or pure EV like the Nissan Leaf, the infrastructure to support the EVs will need to grow FASTER to keep up with the demand to run electric. I find that many of the charging stations that I used to be able to rely on are now getting to be more crowded than before. It’s great to see an uptick in demand, but that just means that the supply needs to increase as well, or the manufacturers will need to come up with something HIGHER ranged than 100 miles. A fact that is driving me toward a Tesla Model S for primary EV and may get me to an i3 with Range Extender. By the way, the picture above is me braking to a stop (thus the regen indicator (the one on the right) as regenerating quite a bit of power back into the batteries). I make the comment on the need for more charging stations because you will note that the PLUG IN NOW Exclamation Point indicator is on (meaning my SOC is less than 30%) and I’ve only gone about 59 miles one way on this picture. Which is to say that my range is closer to 80 miles one way today and I would have to blame that on the distinctive LACK of traffic on the inbound route to work today which had traffic speeds decidedly HIGHER than the posted speed limit. Oh, and a Happy New Year to you too!